Doughnuts are right up there with my favourite treats in the whole world. 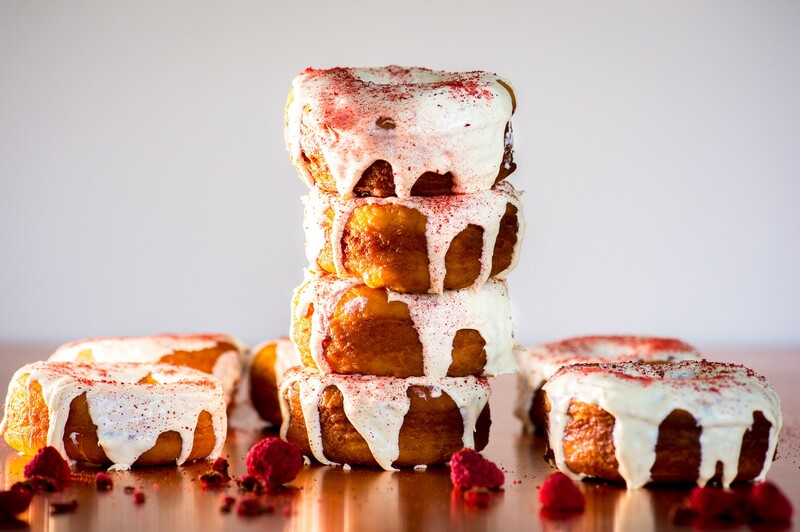 Light and fluffy on the inside, crispy fried on the outside and then either filled with or covered in something sweet and decadent. What’s always put me off making my own is the whole frying business. Being as clumsy as I am, the thought of litres of bubbling hot oil anywhere near me made me a little nervous. Until I discovered the wonder of this Russell Hobbs Digital deep fryer. Not only does it heat the oil in a matter of minutes, but it maintains the temperature of the oil really well, so no waiting around inbetween batches for the oil to reheat. Plus you can control the temperature exactly without the need for a thermometer. 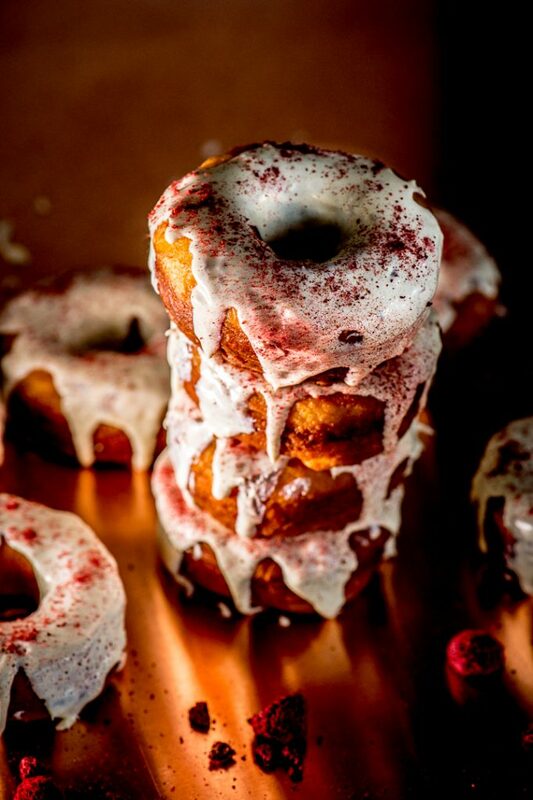 Although simply rolling your freshly fried doughnuts in cinnamon sugar is a perfectly delicious way to serve them, I wanted to try something a little different. 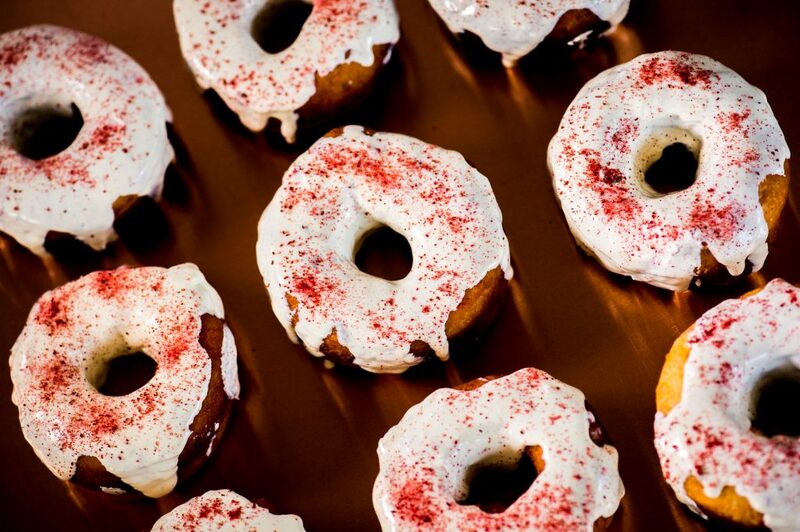 I recently discovered that it’s really easy to make fruit powders at home so I used a bright and tart raspberry powder sprinkled over a rich white chocolate ganache to top my doughnuts. 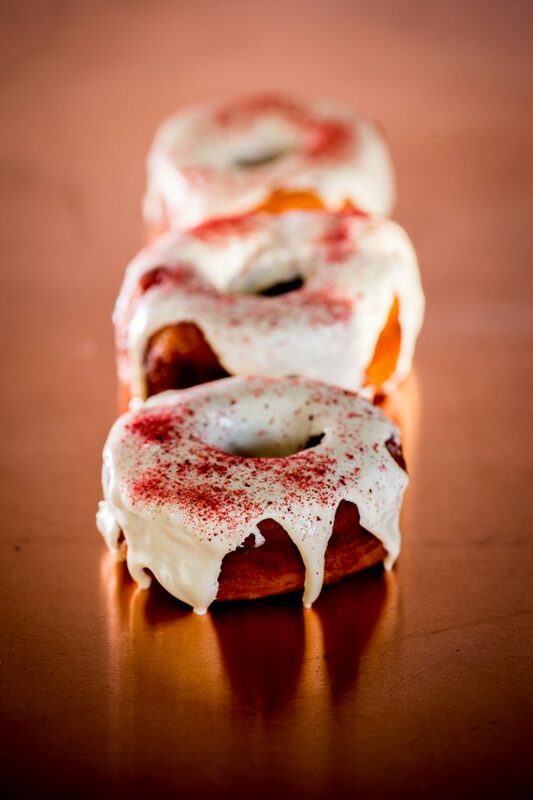 White Chocolate and Raspberry Doughnuts – an absolutely delicious combo if I do say so myself! Start by making the raspberry powder. Preheat your oven to 120°C. Lay the raspberries out on a cooling rack, ensuring they are not touching eachother. Place the cooling rack over a baking tray and place in the oven. The raspberries will take 15-18 hours to dry completely. Give them a shake occasionally so that they dont stick to the cooling rack. Once the raspberries have dried, allow them to cool completely. Place them in a jar or airtight container and freeze overnight. Use a mortar and pestle to crush the frozen, dried raspberries (perhaps keep a few whole for decoration). After crushing them, sieve the powder to remove all the seeds. Store in an airtight container in the freezer until ready to use. To make the doughnuts, warm the milk to lukewarm (not hot or it will kill the yeast) then stir in the sugar and yeast. Set aside for a few minutes. Place the eggs, melted butter and milk mixture into a large bowl. Mix well. Stir together the flour and salt, then add this to the liquid mixture one cup at a time. If you are using a stand mixer, use a dough hook to “knead” the dough for 4-5 minutes. Alternatively knead by hand for 8-10 minutes on a floured surface. The dough will be quite sticky but try not to add too much flour. Place the dough in a greased bowl and cover with clingwrap. Leave to rise in a warm place for about 1 hour, or until doubled in size. Place the dough onto a floured surface and knead for a few minutes. Roll out to 1,5cm thick. Use an 8cm diameter cutter to cut rounds of dough, then cut a 2cm round out of the centre of each of these. I used the back of a large piping nozzle to do this. Place the doughnuts, and doughnuts holes onto a lined baking tray and cover lightly with clingwrap. Leave to rise again for about 20-30 minutes. Pour your oil into your Russell Hobbs deep fryer and heat to 180°C. Gently place 2 – 3 doughnuts into the oil (no more or the oil will cool down too much) using a slotted spoon or spider skimmer. The doughnuts should float to the top immediately. As soon as they are golden brown on one side, turn them over and fry until golden on the other side. This takes 1-2 minutes in total so keep an eye on them! Remove from the oil and set aside to drain and cool on a cooling rack on top of a baking tray. Repeat with the remaining doughnuts and doughnut holes (these cook very quickly). Once the oil has cooled you can filter it and reuse it a few times until it darkens in colour, then chuck it. Chop the white chocolate and place in a heatproof bowl. Heat the cream until just starting to bubble on the edges, then pour over the chocolate. Leave for 1 minute, then stir until melted and smooth. You may need to microwave the ganache for a further 15-30 seconds to melt the chocolate completely. 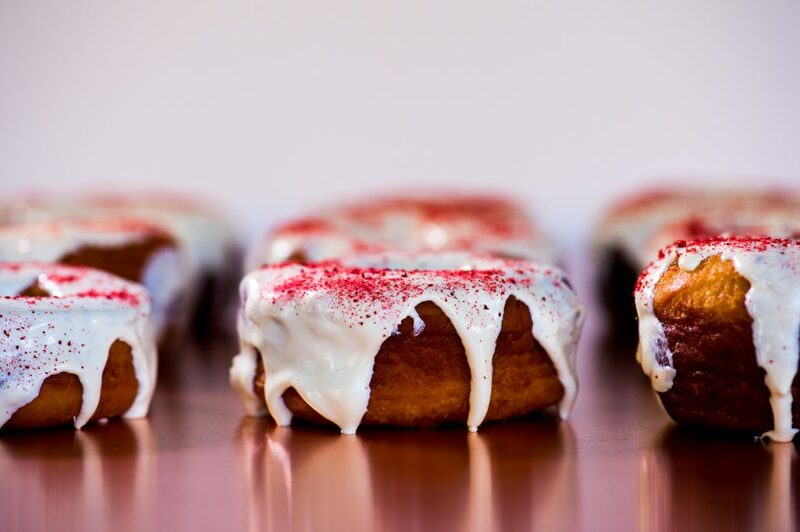 Spoon the white chocolate ganache over the doughnuts (catching the excess on a tray underneath) then sprinkle with the raspberry powder. Best eaten on the same day, so invite some friends over and share! TIP: To enhance the pink colour of the raspberry powder, add a couple of pinches of pink powdered food colouring. I also added a teaspoon of white powdered food colouring to the white chocolate ganache so that the colours contrasted nicely.